PGPB can improve the growth and development of plant species via several mechanisms, such as nitrogen fixation, phosphate solubilization, phytohormone synthesis and increased iron uptake by the production of siderophores.6 Moreover, PGPB can also benefit plants by exhibiting protective action against pathogens, diseases and environmental stresses.7 In addition, PGPB can colonize the roots of plant species and create a favorable microenvironment for plant development. Thus, the inoculation of agricultural species with PGPB represents a very promising technique. Several studies have shown that co-inoculation of legume species with rhizobia and PGPB has a beneficial effect on the growth and development of plants.12 In this context, we hypothesized that co-inoculation with Bradyrhizobium sp. and PGPB optimizes the development and the BNF of cowpea by mitigating the deleterious effects of salt stress. Metabolites and key enzymes of carbon and nitrogen metabolism were evaluated in cowpea inoculated with Bradyrhizobium sp. and co-inoculated with Bradyrhizobium sp. and PGPB in the presence and absence of salt stress. Bradyrhizobium sp. and plant growth promoting bacteria used in the experiment. The experiment was conducted under axenic conditions in a greenhouse (air temperature of 31°C, air humidity of 60% and a day length of 9h). The seeds of cowpea cultivar ‘IPA 206’ were disinfested17 and sown in Leonard pots containing washed (pH 6.5) and autoclaved (1h; 120°C; 101kPa) sand. At the time of sowing, the seeds were inoculated using 1.0mL of the bacterial suspension (108CFUmL−1) with Bradyrhizobium sp. or co-inoculated with 1.0mL of the bacterial suspension containing Bradyrhizobium sp. and 1.0mL of the bacterial suspension containing a strain of PGPB (107CFUmL−1). Co-inoculations were formulated in accordance with the information in Table 1. Throughout the experiment, the plants were irrigated by capillarity with an N-free nutrient solution,18 as modified by Silveira et al.19 Thinning was carried out at four days after germination (DAG), and two plants per pot (experimental unit) were maintained. The plants were subjected to salt stress at 15 DAG, in which 50mmolL−1 sodium chloride (NaCl) was added to the nutrient solution. The nutrient solutions (pH of 6.5) were placed in Leonard jars and changed weekly. At the time, the substrate was washed with distilled water, and the pH and electrical conductivity (EC) of the drainage were measured to match the pH and EC of the vessel; the EC values were 0.99mScm−1 and 5.6mScm−1 for the control and stress treatments, respectively. At 37 DAG, the roots containing nodules were immersed in liquid nitrogen and then kept at -80°C. For transport, the nodule-containing roots frozen in liquid N2 were stored in thermal containers containing dry ice. The frozen nodules were lyophilized, macerated and stored in a desiccator until their biochemical determination. Only the cowpea plants co-inoculated with Bradyrhizobium sp. and P. graminis (T3) showed low nitrogen content in the nodules, regardless of whether they were grown in the presence or absence of salt stress (Fig. 1A). When comparing cultivation conditions, the plants cultivated in the absence of salt stress showed higher nitrogen content in their nodules, regardless of inoculation. The total nitrogen in the nodules of the cowpea plants was affected by the presence of salt stress, as the plants grown under this condition showed a 9.7% decrease in this variable (Fig. 1B). The ammonia and free amino acids content in the nodules decreased by 10.4% when the plants were cultivated under salt stress in relation to the plants grown under control conditions, regardless of the bacterial combination used in the inoculation (Fig. 2A and B, respectively). The ureides content was 39.8% lower in the plants that were cultivated under salt stress than in the plants grown under control conditions (Fig. 2C). Nitrogen total nodules (*CV=10.42%) of cowpea plants cv. “IPA 206” inoculated with Bradyrhizobium sp. (T1) or co-inoculated Bradyrhizobium sp. and Actinomadura sp. (T2), Bradyrhizobium sp. and Paenibacillus graminis (T3), Bradyrhizobium sp. and Bacillus sp. (T4) and Bradyrhizobium sp. and Streptomyces sp. (T5) (A), without and with salt stress induction (0 and 50mmolL−1 NaCl) (B). Means followed the same letter lower (bacterial combinations) and capital (cultivation conditions) not differ statistically (p<0.05) according to Tukey's test. *Variation's coefficient. Free ammonia (A) (*CV=14.57%), free amino acids (B) (CV=14.57%), ureides (C) (CV=33.47%) and shoot dry matter (D) (CV=18.17%) in cowpea plants nodules grown without and with saline stress (0 and 50mmolL−1 NaCl), inoculated with Bradyrhizobium sp. (T1) or co-inoculated Bradyrhizobium sp. and Actinomadura sp. (T2), Bradyrhizobium sp. and Paenibacillus graminis (T3), Bradyrhizobium sp. and Bacillus sp. (T4) and Bradyrhizobium sp. and Streptomyces sp. (T5). Means followed the same letter not differ statistically (p<0.05) according to Tukey's test. *Variation's coefficient. Regarding the response of the proline content in the nodules of plants, co-inoculation with Bradyrhizobium sp. and Streptomyces sp. (T5) differed from the inoculation with Bradyrhizobium sp. (T1) (Fig. 3A); the proline content in the nodules of cowpea increased when the plants were subjected to salt stress (Fig. 3B). The plants that were inoculated with Bradyrhizobium sp. and co-inoculated with Bradyrhizobium sp. and Actinomadura sp. (T2) or Bradyrhizobium sp. and Bacillus sp. (T4) showed increased leghemoglobin contents, regardless of whether the plants were grown in the presence or absence of salt stress. On the other hand, compared with inoculation with Bradyrhizobium sp. (T1), co-inoculation with Bradyrhizobium sp. and P. graminis (T3) or Bradyrhizobium sp. and Streptomyces sp. (T5) reduced the leghemoglobin content (Fig. 4A). Proline (*CV=39.18%) in cowpea nodules inoculated with Bradyrhizobium sp. (T1) or co-inoculated Bradyrhizobium sp. and Actinomadura sp. (T2), Bradyrhizobium sp. and Paenibacillus graminis (T3), Bradyrhizobium sp. and Bacillus sp. (T4) and Bradyrhizobium sp. and Streptomyces sp. (T5) (A), without and with salt stress induction (0 and 50mmolL−1 NaCl) (B). Means followed the same letter lower (bacterial combinations) and capital (cultivation conditions) not differ statistically (p<0.05) according to Tukey's test. *Variation's coefficient. Leghemoglobin (*CV=15.51%) (A) and total soluble proteins (*CV=39.18%) (B) in cowpea nodules inoculated Bradyrhizobium sp. (T1) Bradyrhizobium sp. and Actinomadura sp. (T2), Bradyrhizobium sp. and Paenibacillus graminis (T3), Bradyrhizobium sp. and Bacillus sp. (T4) and Bradyrhizobium sp. and Streptomyces sp. (T5), independent of the cultivation condition and without and with salt stress induction (0 and 50mmolL−1 NaCl), respectively. Means followed the same letter lower not differ statistically (p<0.05) according to Tukey's test. *Variation's coefficient. When the cowpea plants were grown under the control conditions, the nodules of plants inoculated with Bradyrhizobium sp. (T1) and co-inoculated with Bradyrhizobium sp. and Actinomadura sp. (T2) showed higher soluble protein content; in the presence of 50mmolL−1 NaCl, the soluble protein content increased in the nodules of plants inoculated with Bradyrhizobium sp. (T1) and co-inoculated with Bradyrhizobium sp. and Bacillus sp. (T4) (Fig. 4B). The Bradyrhizobium sp. and P. graminis (T3) and the Bradyrhizobium sp. and Bacillus sp. (T4) co-inoculated plants as well as the control plants did not exhibit reduced soluble protein contents in the nodules when cultivated under salt stress (Fig. 4B). When comparing the cultivation conditions, the nodules of plants co-inoculated with Bradyrhizobium sp. and P. graminis (T3) and Bradyrhizobium sp. and Bacillus sp. (T4) presented higher soluble protein contents when the plants were grown under salt stress compared to those grown under control conditions. These bacterial combinations allowed the production of soluble proteins in the nodules in an equivalent manner even when subjected to salt stress. 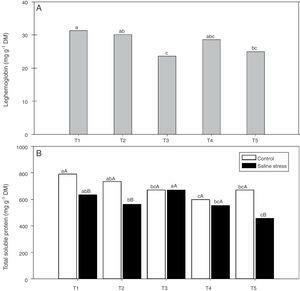 The plants that were co-inoculated with the other treatments (T2 and T5) showed decreased soluble protein contents when grown in the presence of NaCl (Fig. 4B). The nodules of plants co-inoculated with Bradyrhizobium sp. and Streptomyces sp. (T5) presented increased sucrose content when the plants were cultivated under control conditions; however, when 50mmolL−1 NaCl was added to the nutrient solution, the co-inoculations that provided increased sucrose content in nodules were Bradyrhizobium sp. and P. graminis (T3) and Bradyrhizobium sp. and Bacillus sp. (T4) (Fig. 5A). When comparing the effect of salinity on the co-inoculations, it was observed that the plants inoculated with Bradyrhizobium sp. (T1) and co-inoculated with Bradyrhizobium sp. and P. graminis (T3) and Bradyrhizobium sp. and Bacillus sp. (T4) showed increases in sucrose content of 151.7%, 240.2% and 138.2%, respectively, when the plants were subjected to salt stress compared to those grown under control conditions (Fig. 5A). 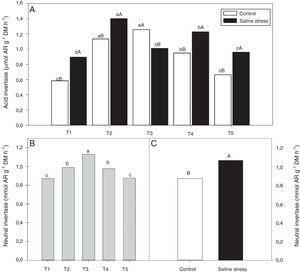 Sucrose soluble (*CV=18.52%) (A) and sugars soluble (CV=14.62%) (B) in cowpea plants inoculated with Bradyrhizobium sp. (T1) or co-inoculated Bradyrhizobium sp and Actinomadura sp. (T2), Bradyrhizobium sp. and Paenibacillus graminis (T3), Bradyrhizobium sp. and Bacillus sp. (T4) and Bradyrhizobium sp. and Streptomyces sp. (T5), without and with salt stress induction (0 and 50mmolL−1 NaCl) (B). Means followed the same letter lower (bacterial combinations) and capital (cultivation conditions) not differ statistically (p<0.05) according to Tukey's test. *Variation's coefficient. There was no difference between the inoculated bacterial combinations regarding the soluble sugar content in the plants grown under control conditions. When the plants were cultivated in the presence of NaCl, the soluble sugar content increased in the plants co-inoculated with Bradyrhizobium sp. and Actinomadura sp. (T2), Bradyrhizobium sp. and P. graminis (T3), Bradyrhizobium sp. and Bacillus sp. (T4) and Bradyrhizobium sp. and Streptomyces sp. (T5) (Fig. 5B). When comparing saline and control conditions, the soluble sugar content increased by 182.9%, 528.7% and 121.9% in the plants co-inoculated with Bradyrhizobium sp. and P. graminis (T3), Bradyrhizobium sp. and Bacillus sp. (T4) and Bradyrhizobium sp. and Streptomyces sp. (T5), respectively, when those plants were grown under salt stress (Fig. 5B). The activity of glutamine synthetase (GS) increased in plants co-inoculated with Bradyrhizobium sp. and Actinomadura sp. (T2) and Bradyrhizobium sp. and Streptomyces sp. (T5), under control conditions. Under salt stress conditions, the highest GS activity in the plant nodules was exhibited by the plants co-inoculated with Bradyrhizobium sp. and P. graminis (T3) and Bradyrhizobium sp. and Bacillus sp. (T4) (Fig. 6A). When evaluating the effect of stress for each inoculation, only the plants co-inoculated with Bradyrhizobium sp. and Bacillus sp. (T4) showed no reduction in GS activity when those plants were cultivated under salt stress compared to those grown under control conditions. On the other hand, the plants co-inoculated with Bradyrhizobium sp. and P. graminis (T3) showed higher GS activity when cultivated under salt stress than when cultivated under control conditions (Fig. 6A). Activity of glutamine synthetase (*CV=14.48%) (A), activity of glutamate synthase (B) (*CV=13.59%) and glutamate dehydrogenase aminating (C) (*CV=19.59%) on nodules of cowpea plants inoculated Bradyrhizobium sp. (T1) or co-inoculated Bradyrhizobium sp. and Actinomadura sp. (T2), Bradyrhizobium sp. and Paenibacillus graminis (T3), Bradyrhizobium sp. and Bacillus sp. (T4) and Bradyrhizobium sp. and Streptomyces sp. (T5), without and with salt stress induction (0 and 50mmolL−1 NaCl), and independent of the cultivation condition, respectively. Means followed the same letter lower (bacterial combinations) and capital (cultivation conditions) not differ statistically (p<0.05) according to Tukey's test. *Variation's coefficient. The nodules of plants co-inoculated with Bradyrhizobium sp. and Bacillus sp. (T4) and Bradyrhizobium sp. and Streptomyces sp. (T5) showed increased activity of the enzyme glutamate synthase (GOGAT), regardless of cultivation conditions (Fig. 6B). Similarly, glutamate dehydrogenase (GDH) activity increased in the nodules of plants of cowpea inoculated with Bradyrhizobium sp. (T1) and co-inoculated with Bradyrhizobium sp. and Actinomadura sp. (T2) and Bradyrhizobium sp. and P. graminis (T3), regardless of cultivation conditions (Fig. 6C). The acid invertase activity increased in the nodules of plants co-inoculated with Bradyrhizobium sp. and Actinomadura sp. (T2) and Bradyrhizobium sp. and P. graminis (T3) when those plants were grown in the absence of salt stress. On the other hand, when the plants were grown under salt stress conditions, the highest activity of acid invertase occurred in response to co-inoculation with Bradyrhizobium sp. and Actinomadura sp. (T2) (Fig. 7A). Activity acid invertase (*CV=7.87%) (A) and activity neutral invertase (*CV=4.52%) (B and C) in nodules in cowpea inoculated Bradyrhizobium sp. (T1) or co-inoculated Bradyrhizobium sp. and Actinomadura sp. (T2), Bradyrhizobium sp. and Paenibacillus graminis (T3), Bradyrhizobium sp. and Bacillus sp. (T4) and Bradyrhizobium sp. and Streptomyces sp. (T5), without and with salt stress induction (0 and 50mmolL−1 NaCl). Means followed the same letter lower (bacterial combinations) and capital (cultivation conditions) not differ statistically (p<0.05) according to Tukey's test. *Variation's coefficient. When evaluating the different cultivation conditions, it was observed that the plants inoculated with Bradyrhizobium sp. (T1) and co-inoculated with Bradyrhizobium sp. and Actinomadura sp. (T2), Bradyrhizobium sp. and Bacillus sp. (T4) and Bradyrhizobium sp. and Streptomyces sp. (T5) exhibited increased acid invertase activity in their nodules when cultivated using nutrient solution supplemented with 50mmolL−1 NaCl (Fig. 7A). The neutral invertase activity increased in the nodules of cowpea plants co-inoculated with Bradyrhizobium sp. and P. graminis (T3), regardless of cultivation conditions; in addition, this co-inoculation exhibited the highest sucrose content in the presence of salt stress. When comparing cultivation conditions, the plants subjected to salt stress showed higher neutral invertase activity in their nodules than did the plants grown under control conditions (Fig. 7B). In this study, co-inoculation of cowpea with Bradyrhizobium sp. and PGPB provided a significant increase in nitrogen content, leghemoglobin content and proline content in the nodules, regardless of cultivation conditions. Leghemoglobin is a hemoprotein and is present in the nodules of legumes; its function is to transport oxygen to maintain the aerobic metabolism of bacteroids without inhibiting nitrogenase activity.33 Co-inoculation between Rhizobium and PGPB enabled an increase in shoot nitrogen content and maintained the soluble protein content even in plants under salt stress. 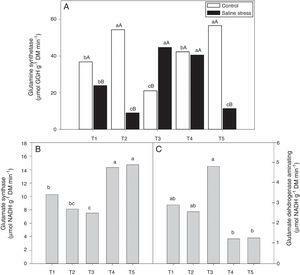 Under greenhouse conditions, evaluating nitrogen and carbon compounds as well as the activities of some enzymes of carbon and nitrogen metabolism, Rodrigues et al.,12 reported that cultivated cowpea plants co-inoculated with Bradyrhizobium sp. and P. graminis presented increased nitrogen contents in their nodules and that the nitrogen content did not present a significant difference between the studied treatments. The same results did not occur in this work, as co-inoculation with Bradyrhizobium sp. and P. graminis presented the lowest nitrogen content in the nodules, reinforcing the need for studies on co-inoculation and synergism among the bacteria involved. The plants subjected to salt stress survived the 5.6mScm−1 electrical conductivity of the nutrient solution; indeed, this species is moderately tolerant to salinity and is able to tolerate saltwater irrigation with maximum electrical conductivity of 3.3dSm−1.34 These survival results may also indicate the in vivo tolerance of the Bradyrhizobium sp. (UFLA 03-84) strain to salinity, since this strain was used to maintain control plants (without inoculation) under salt stress; however, these bacteria did not survive during the experiment (data not shown). These data corroborate the result of Nóbrega et al.,35 who revealed the in vitro tolerance of Bradyrhizobium sp. (UFLA 03-84) to be 30gL−1 NaCl, which is considered highly tolerant to salinity, and indicate that this bacterial strain is well suited for inoculation tests that aim to increase the yield of cowpea under salinity conditions. Co-inoculations with Bradyrhizobium sp. and Actinomadura sp. and Bradyrhizobium sp. and P. graminis were more efficient at not altering the levels of carbon skeletons under control conditions. However, when the plants were subjected to salt stress, co-inoculation with Bradyrhizobium sp. and Actinomadura sp. maintained the invertase activity at a high level, maintaining the levels of carbon skeletons without major changes in cowpea nodules, thus maintaining the BNF performed by bacteroids.44 In this study, it can be verified that the synergistic interaction between diazotrophic bacteria and PGPB can provide increased nodulation, resulting in positive effects by increasing BNF via nitrogen–carbon metabolism in cowpea plants under salt stress conditions. Inoculation with Bradyrhizobium sp. (UFLA 03-84) and co-inoculations with Bradyrhizobium sp. and Actinomadura sp. (UFLA 03-84 and 183-EL), Bradyrhizobium sp. and Bacillus sp. (UFLA 03-84 and IPACC11), and Bradyrhizobium sp. and Streptomyces sp. (UFLA 03-84 and 212) were more efficient at nitrogen fixation, even when the plants were grown under conditions of 50mmolL−1 NaCl. The combinations of the microorganisms Bradyrhizobium sp. and Bacillus sp. (UFLA 03-84 and IPACC11) and Bradyrhizobium sp. and Streptomyces sp. (UFLA 03-84 and 212) elicited the GS/GOGAT pathway to incorporate ammonium, even when the plants were subjected to salinity stress. Overall, co-inoculations with Bradyrhizobium sp. and Actinomadura sp. (UFLA 03-84 and 183-EL) and Bradyrhizobium sp. and P. graminis (UFLA 03-84 and MC 04.21) benefited the carbon metabolism in cowpea plants, even when cultivated under salinity stress.